This KPI and Phased format is excellent for Change Programme plans and Product Plans. 1. 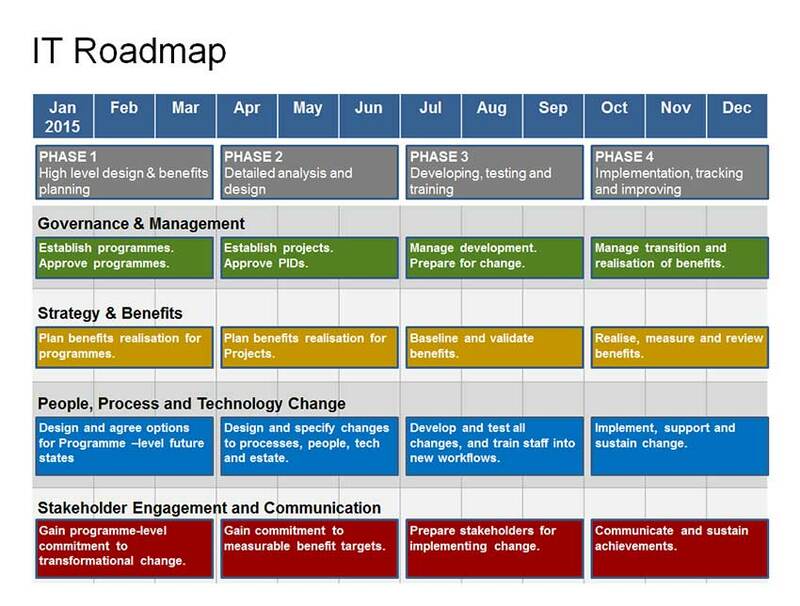 Roadmap Template Variation 1: Phases, KPI, Development and PEST Factors. Powerpoint Roadmap with PEST Factors Template – Variation 1. Legend: Status and Risk Levels for projects and PEST factors. Timeline: Uses standard Powerpoint table, so you can change it easily. Business Change stream: Shows Starting State, 3 Phases, and Target State. KPI stream: Shows the Key Performance Indicators to keep targets in mind. Development stream: This is the main stream to describe your project work. 2. Roadmap Template Variation 2: Separate “COMMS” and “PRODUCT” Workstreams. 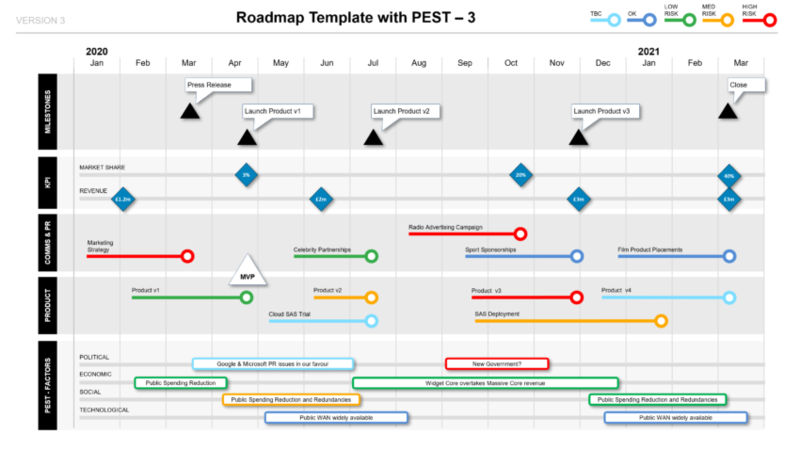 Variation 2 of the Powerpoint Roadmap with PEST Factors Template. COMMS & PR: For promotional activities. PRODUCT: For product delivery work. 3. Roadmap Template Variation 3: Product Planning format. Variation 3 of the Powerpoint Roadmap with PEST Factors Template. MILESTONES: The top stream is for Milestone and key project dates. This is more suitable for normal Product Planning. The “PEST” swim lane in the Powerpoint Roadmap with PEST Template. Rating for Powerpoint Roadmap Template with PEST Factors & Milestones Template: 4.9 out of 5 , based on 2 customer reviews.